The legendary New York Cosmos are back. This official replica men's soccer jersey from Umbro is a re-issue of the 1977 New York Cosmos home jersey, worn by footballing legend Pele.This jersey features an embroidered Cosmos logo on the chest and felt No.10 numbering on the sleeve and chest. 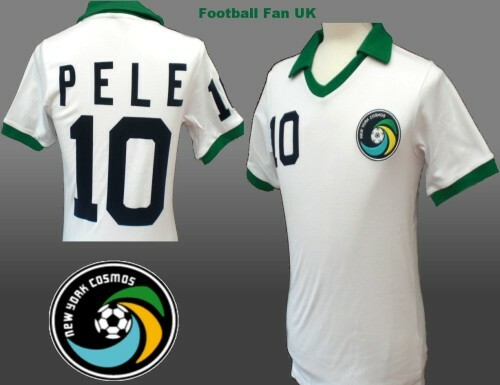 Pele's name and number are placed on the back in felt and, completing this shirt, the sleeves and collar have a green trim. Made from 100% cotton. Comes with special New York Cosmos swing tags.